Tile-fronted pub at the heart of Camden market territory, given an unusual shape by its corner location. 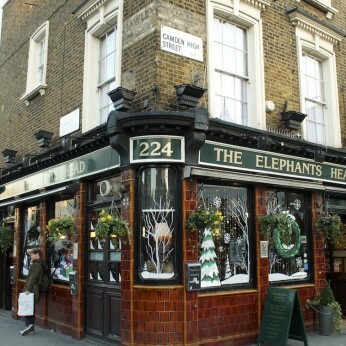 Some say the name derives from the Elephant Pale Ale brewed by the Camden Brewery which stood nearby and operated until 1925. However, it is more likely that it comes from the coat of arms of the Marquess of Camden, which is now on top of the London Borough of Camden coat of arms, an elephant's head. Incidentally the Marquess actually lived in Chislehurst near Bromley, and used to commute to Camden. Many road names in Chislehurst and Camden are similar! The house beer - Elephant's Head - is Caledonian 80/-. Being handy for Camden Lock, the Roundhouse etc, can get crowded weekends.